Situated on the Road to the Isles, Glenfinnan is a very historical place with a National Trust Visitor Centre as well as being ideally located for a variety of touring and activities . 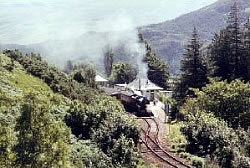 Steam trains pass along the West Highland line in summer and stop at the restored Glenfinnan Station Museum. 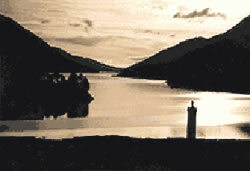 There are cruises down Loch Shiel. 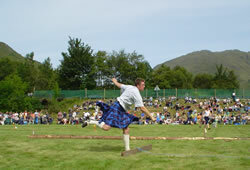 Visit the local Glenfinnan website for more details on the village. 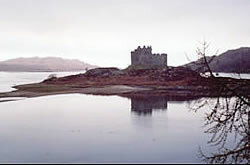 With Glenfinnan as a touring base, Loch Ness, The Isle of Skye, Ardnamurchan and Oban are all a comfortable day out. 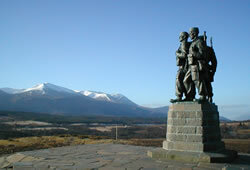 Fort William and Glen Nevis. Only 25 mins away the town has a wealth of tartan and souvenir shops, as well as a cinema, leisure centre with pool, sauna, climbing wall, squash and fitness room, museum with Jacobite artefacts and of course the tourist information centre. The beauty of Glen Nevis with walks, waterfalls and visitor centre is only a short drive away, and the road home crosses the Caledonian canal with the famous "Neptune's Staircase" and the best views of Ben Nevis. An alternative route back is to head out of Fort William South to the Corran Ferry, cross the narrows of Loch Linnhe, and return on the opposite side of the loch with breathtaking views over to Ben Nevis. Loch Ness and Inverness. The road up the Great Glen takes you past Scotland's most famous Loch, Loch Ness with its elusive monster and the dramatic ruins of Urquhart Castle. Inverness is a pleasant city with our nearest Marks and Spencer, but the chief tourist attraction is Culloden Battlefield with its visitor centre, situated some 5 miles East of the city. It is possible to return down the minor road on the opposite shores of Loch Ness which follows the old General Wade Military Road to Fort Augustus. Mallaig and Skye. The "Road to the Isles" up to Mallaig is one of the most scenic routes in the world, with some of the most memorable views over the Minch to the Small Isles of Rum, Eigg and Muck, along with beautiful beaches which were used to film "Local Hero". From Mallaig regular (3hr) ferries sail over the 20min crossing to Skye, which on a fine day has scenery out of this world. An alternative route home is over the Skye Bridge and through Glen Shiel past Eilan Donan castle to meet the Great Glen Road at Invergarry. A full day trip but with memories for a lifetime. Ardnamurchan peninsula. The road out to the lighthouse at Kilchoan, the most Westerly point on the British mainland, is one of the most remote and narrow in this country, but with a special blend of scenery that brings visitors back year after year. Once past the turn off at Salen you enter a different world where time slows down and you can appreciate this unspoiled and vast paradise. A whole day is never enough, particularly if the sun is out and you get glued to the beach at Sanna! The Rough Bounds. The traditional name given to the districts of Morar and Morvern because of their inhospitable nature, they were tamed in the 60's with the building of a new road which gives a beautiful circular day trip round a little known corner of Scotland. We still have guests who have been coming to Scotland for years and have only just "found" this day out. The journey goes up to Lochailort, down through Glenuig to Acharachle and Salen (turn for Ardnamurchan) to reach Strontian, whence back via Ardgour to Home! Mull. If you only ever visit one island, make it Mull! 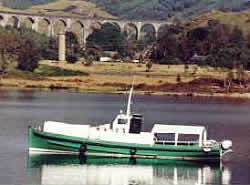 A regular ferry (20 mins) runs from Lochaline, which can easily be reached from the Strontian road (allow at least 2 hours from the Lodge). Tobermory on Mull is a picture-postcard village (having recently been reincarnated as Balamory in the children's TV programme), and after lunch there you can come back over the Oban ferry to make a memorable round trip home.